So I love food - I love seafood, some of my family members are not such huge fans of seafood, but I am going to give you a few of my favorites and where they are located. 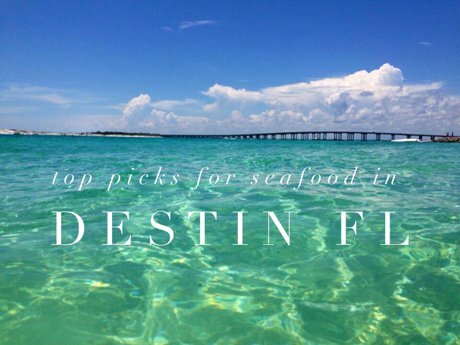 Today I am focusing on my top 10 in Destin, because we have so many great places, I think breaking everything down is the easiest. If you love seafood like I do, and this is not in any particular order - you can ask me for my favorite, but I know many of these owners so in all fairness, if they are on my list, they are a winner! 1. Harbor Docks on the Destin Harbor is a fresh caught seafood and they even serve breakfast. Open 7 days a week- you can sit out on the back and watch the sunsets and the dolphins play, this is fresh and you can order something for everyone! They get busy especially during dinner - but they do have valet service available. They are located at 538 Harbor Blvd in Destin. They also have an awesome sushi menu, this is a locals casual favorite! 2. Camille's and Harbordocks are owned by the same person. Camille's is located on the old beach road in Destin, 2931 Scenic Hwy 98. It is a little quieter and smaller and a little more upscale. They also have a sushi menu but the menu's are a little different, so it is worth checking both out. Camille's also has a casual cafe below for beach food on the go - they have a coffee bar and smoothies as well as a quick bite for breakfast or lunch as well as a a bar. This is a great stop after the beach or before and it is located in Crystal Beach right by the public beach access. 3. Dewey Destin's Seafood and I love hushpuppies and they have some really good ones. Dewey Destin has 2 locations, one is on the Harbor - 202 Harbor Blvd. in Destin and the other is the crab island location - 9 Calhoun Avenue. Both are fairly casual, with the crab island location being much more casual. Locals often pull up via boat grab a bite to eat in bathing suits and go right back out to Crab Island. In the evening you can watch the dolphins play and see some of the most amazing sunsets. The shrimp basket is one of my favorites!!! 4. Boshamps! Also located on the Harbor in Destin - located at 414 Harbor Blvd - this is a great venue for families because (besides the awesome food) they have a sandy beach area for the kids to play while you are waiting for your food. As a mother of five, this makes my dinner very relaxing. One little tidbit, they have valet parking, don't park across the street at the bank, they will tow you. As for the food it is amazing and again local!!! The cheese grits and feta cheese dip is awesome, they are known for their oysters. It is a great atmosphere and I have never been disappointed! 5. The Louisiana Lagniappe this is located on Holiday Isle behind the Sandpiper on 775 Gulf Shore Drive. You have to go through the guard gate but they will give you directions. As the name indicates they have a Louisiana influence that is so worth the trip! Try the bread pudding - really! Grouper is one of my favorite fish because it is light and always fresh here! My personal favorite is grouper pontchartrain or the shrimp and grits! You just can't go wrong here. This is a little more upscale, but remember you are in Destin, we are casual by nature everywhere, but the dining is upscale. 6. The Marina Cafe romantic, upscale and again, on the harbor! This is located at 404 Harbor Blvd. If you have a meat eater in the family - this will work for all of you. They have a great dessert menu as well - so not what I would consider casual but great views, great food and great ambiance. 7. 790 on the Gulf finally a place on the beach! This is located inside the Inn at Crystal Beach so you walk in and go straight back and down the stairs. 2996 Scenic Hwy 98 and you are on the beach! They have a Sunday brunch with a New Orleans flare and a full bar. They are known for their gumbo so try it! I like the Redfish (another light fish that is local) and my girls love the gumbo. The bread pudding here is also worth trying! 8. Brotula's on the Harbor! 210 Harbor Blvd - home of the build your own boil! You can pick and choose if you can't decide, but personally I like the fried green tomatoes and the shrimp and grits. Brotulas is also known for their oysters! I have not had dessert so I can not comment, but the atmosphere is fun and casual and the customer service has always been great! 9. Lulu's ok one of my personal favorites for the atmosphere alone! 4607 Legendary Marina Drive If you have kids, or you want to sit out at the tiki bar and have a cocktail or if you are looking for entertainment - this is the place to go! It is actually located on the Bay right at the foot of the mid-bay bridge, They have outdoor games and sand and all sorts of fun things for the kids to do while you are waiting OR if you do not have kids, they usually have big screen tv's with sports playing and it is covered but all open. The kids will come back sandy so bring baby powder (a local trick - I will talk about later, but baby powder removes our sugar sand). They have a shop and paddleboard and kayak rentals and a huge menu! They are famous for their crab melt and of course, their most awesome Krispy Kreme Bread Pudding!!! It is a must!!! 10. Now with this said - I am not a big fan of the touristy places, but these 2 are beachfront and actually pretty good food so they are making the cut - The Crab Trap and The Back Porch. First the Crab Trap - it is right on the beach, 3500 Scenic Hwy 98 and they have some pretty good food and a playground and an outdoor bar - most definitely worthy of my top 10. They even have a BEACH CAM you can check out that is live! The views are ah-mazing and they are located at the public beach so if you are patient you can find a spot to park. Now, The Back Porch - also on the beach and casual, this is fun to watch the sunsets and the crab cakes are usually what I get or of course the grouper and grits are a winner too. The back porch is more mid Destin - 1740 Scenic Hwy 98 and it has been around for a long time!